1.Make sure your child is ready. When assessing whether or not your child with autism is ready for potty training, behavior is more of an indicator than age. Your child may be ready if they ask to be changed when they’re wet or soiled either verbally, by removing a dirty diaper or by getting a clean diaper. You also want to make sure your child can follow simple, one-step directions before you tackle potty training. If your child is nonverbal, there are some extra steps you can take to ensure clear communication. Keep an eye on your child’s behavior as you start to potty train so you can pick up on their signals that they need to go to the bathroom. You may notice them wiggling, rocking or looking intently at you or in the direction of the bathroom. To encourage communication, you may give your child a picture of a toilet that they can point to when they need to go. They can keep it in their pocket or attached to their clothing for easy access. 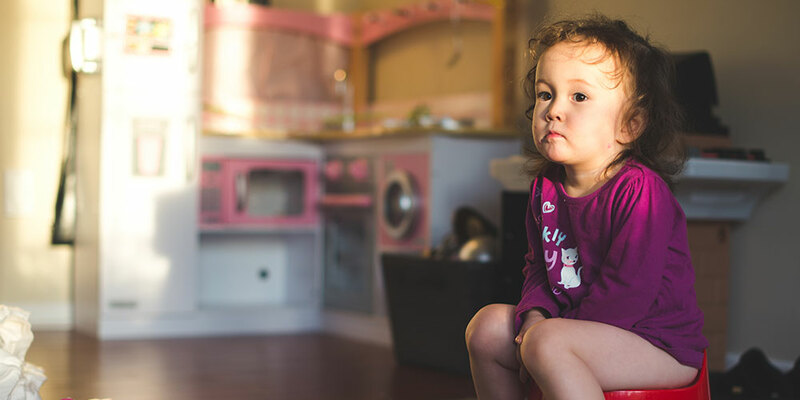 When you’ve determined that your child is ready to start potty training, make sure you’re ready. This is a big step for both of you, so choose a time where stress will be minimized. If there are any big changes coming up, like starting a new routine or a close family member moving away, consider postponing potty training until things settle down. 3. Plan a potty schedule around your child’s routine. A few days before potty training begins, start keeping track of your child’s current routine so you can get an idea of their potty schedule. Check your child’s diaper every 30 minutes to see if they are wet, dirty or dry, and then write it down in a notebook. When you figure out their potty schedule, set reminders for yourself to take them to the bathroom to try to potty before they would normally be wet or dirty. Your child can also wear a potty watch that reminds them to go potty every 30, 60 or 90 minutes. It will not only remind your child, but it will also keep the whole family on track and attentive to when it’s time to go potty. 4. Get your bathroom ready. You’re going to be spending a lot of time in the bathroom, so take some time to make it as inviting as possible. First, work to eliminate any sensory triggers. Something that you’ve never thought about, like a strong smelling soap or the cold tile floor, may be overwhelming for your child. Next, hang social stories on the wall as a reminder of what to do. Here is a social story for boys and here’s one for girls. To make the bathroom extra special, you might hang pictures of their favorite characters or bring in their favorite books. When you’re done, spend some time hanging out in the bathroom together to reinforce that it can be a positive experience. Below is an example of a potty training social story! Diapers can do their job so well that your child doesn’t feel uncomfortable when they’re wet or dirty. That’s great...until you start potty training! Switching your child to underwear is messy, but it will also make it a lot easier for your child to recognize when they are wet or dirty. If you’re worried about the potential mess, have your child put on underwear underneath their diaper. They will still feel the wetness, but you will avoid some of the mess. Success in potty training is all about positive reinforcement. Start by reinforcing small steps along the way, like going into the bathroom, sitting on the toilet and staying seated. All of those accomplishments will earn your child verbal praise and positive gestures like a thumbs up. If your child has an accident, don’t scold them. Stay positive and keep trying. When your child successfully goes in the potty, that’s a huge deal! Give them a lot of praise and a short term reward like a sticker, watching a video they love or something else that motivates them. When they reach an even bigger milestone, like going potty in the toilet all week, you can give them a reward like a special toy. Potty training is a repetitive process, and there may be times when you feel like you’re not getting anywhere. Keep a log of accidents as well as successful bathroom trips in a notebook or on a potty training app, like PottiTrain, Potty Baby, or Perfect Potty. This will help you track your child’s progress and reassure you that it is working! ABA therapy can help children learn to use the potty and other important self-care skills. To learn more about ABA, fill out the form below! Thank you! A Client Intake Specialist will be in touch shortly. Originally from Little Rock, Arkansas, Mariel has over 10 years of experience working with children with disabilities in Florida, Illinois and Arkansas. She’s focused her past four years in the field of Applied Behavior Analysis and takes specific clinical interest in promoting the improvement of social skills with peers and siblings, as well as in increasing overall independence through self-care skills as her clients grow up. She enjoys spending time with her animals (two dogs and two cats!) and her wife, Lisa.